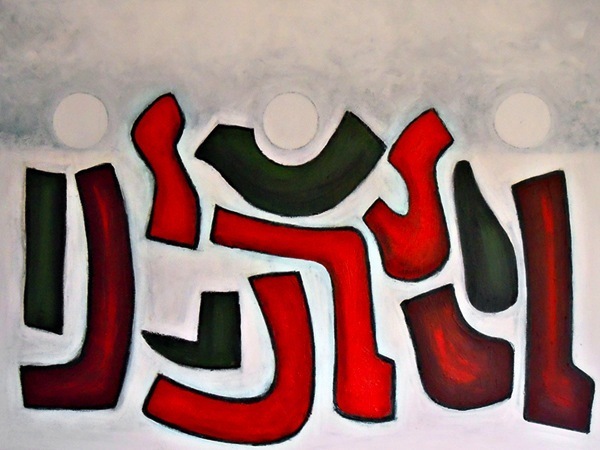 EIGHT RED TRUNKS by Terence Marner, Acrylic on Canvas, 24x36 in, 2005. This painting recently sold to a Swiss Collector. Terence Marner graduated with a degree in Fine Arts from King’s College, University of Durham, England in 1959. He studied under Victor Pasmore and Richard Hamilton, leaders in the Constructed Abstract Art movement of the 1950‘s. In 1959, his artwork toured nationally with “Six Young Contemporaries” chosen by the Arts Council of Great Britain. The Drian Gallery in London exhibited Marner’s graduating portfolio, influenced by both expressionist painters and the Bauhaus movement. Marner completed graduate work at the London Film School in 1972. His two books on film are available in six languages. While teaching at New York University in 1984, he discovered the computer as a creative tool. The pioneer in digital media resumed his research after returning to the Fine Art Faculty at the University of Regina. COMPOSITION IN YELLOW Acrylic on canvas, 36x36 in, 2015. COMPOSITION WITH SIX VARIATIONS Acrylic on canvas, 36x36 in, 2015. Marner’s current studio work is an exciting synthesis of his painting, photography and film expertise. He views his non-objective creations as a form of meditation. The form, light and texture of forest environments informs and inspires the artist. His spiritual journey reflects a multi-faith and humanist sensibility. BYZANTIUM by Terence Marner, Pigmented Ink on Canvas, 24x24 in, 2012. * Winner of “Best Work on Paper or Under Glass” at Sidney Fine Art Show, Oct 2012. As one of three jurors in the Sidney Fine Art Show, Goatley was drawn to the mandala-like qualities in Byzantium. “There is a depth and complexity to this meditative image that invites repeated viewing,” he says. Studying this webpage, David Goatley comments on Marner’s consistent vision explored through many media and methods. 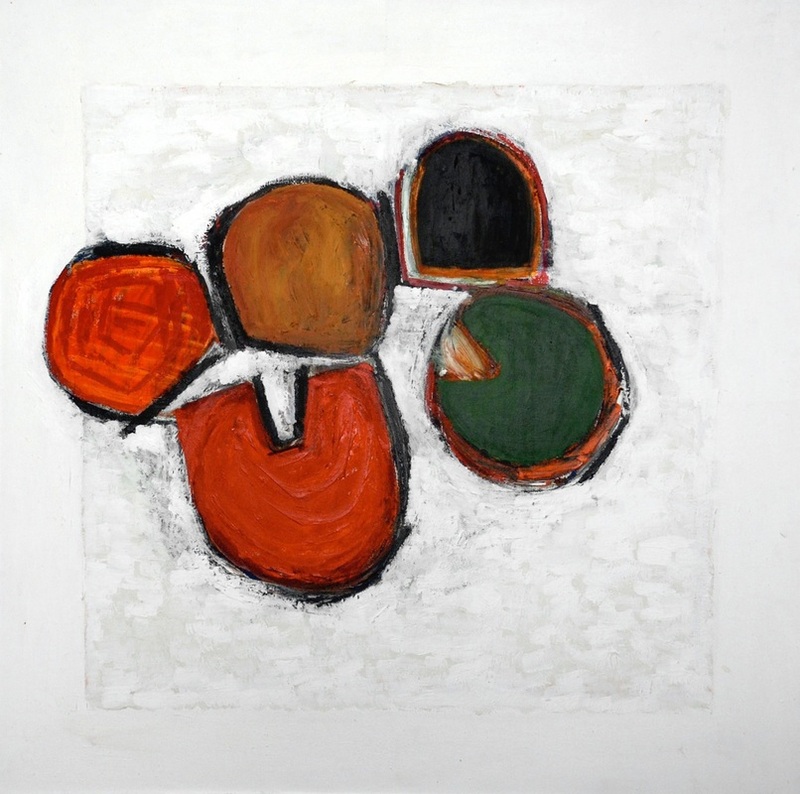 WINTER MOONS by Terence Marner, Acrylic on Canvas,30x40 in, 2013. John Kissick is Director of the School of Fine Art and Music, at the University of Guelph. www.johnkissick.ca. SHORELINE Relief Construction in cedar and birch, 16X16 in, 2014. Sandra Fraser is Associate Curator at the Mendel Art Gallery in Saskatoon. One of three jurors at the Sidney Fine Art Show, she saw over 1000 works on the first day. What stood out in Marner’s digitally created work? “I saw many competent photos,” she says, “but was struck by the playful and experimental quality of Byzantium.” Many photographers do minimal editing with their formal shots, she notes, whereas Terry immerses himself in the process and pushes boundaries. 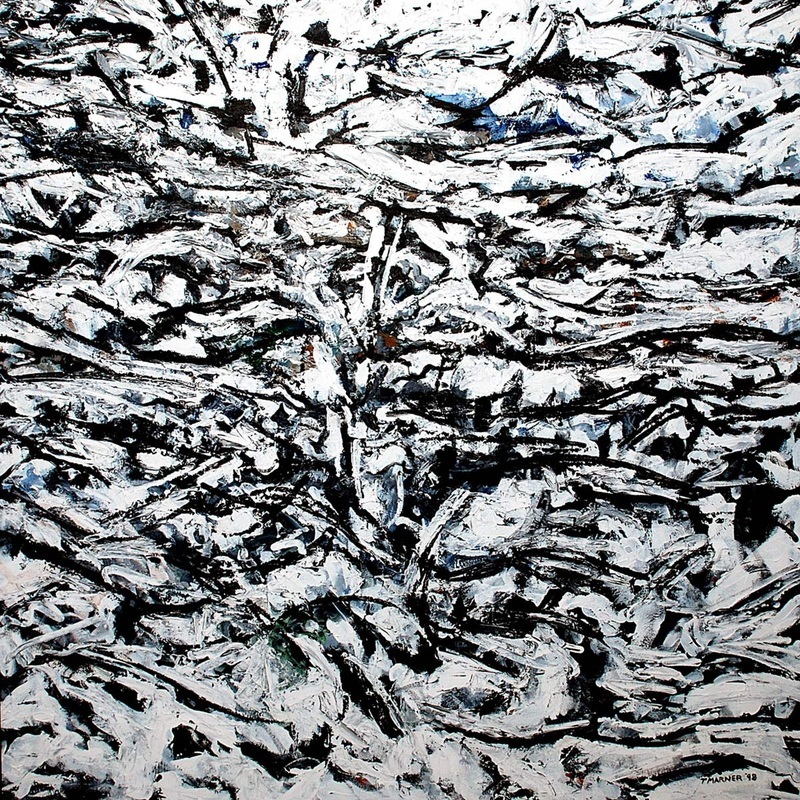 CYPRESS HILLS WINTER Acrylic on Canvas, 48x48 in, 1998. COMPOSITION 1978, Acrylic on Canvas, 36x36 in. Dr. Erica Dodd taught Islamic Art and Architecture at the University of Victoria until 1989. Both Dodd and Marner are Professors Emeriti at UVic’s Centre for the Studies of Religion and Society. 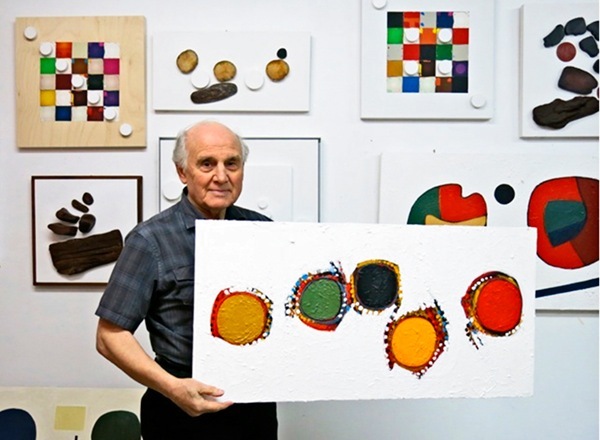 “Terry’s artwork is magnificent,” she says, “his lively imagination and variety of styles is ever-evolving.” “When I began to work with computers in 1984,” says Marner, “ I wanted to produce images that were aesthetically analogous to my acrylic paintings.” He believes that the computer is a tool, like a brush or pencil, that facilitates his unique artistic vision. Marner’s artistic vision involves the transformation of images he receives from the natural world. 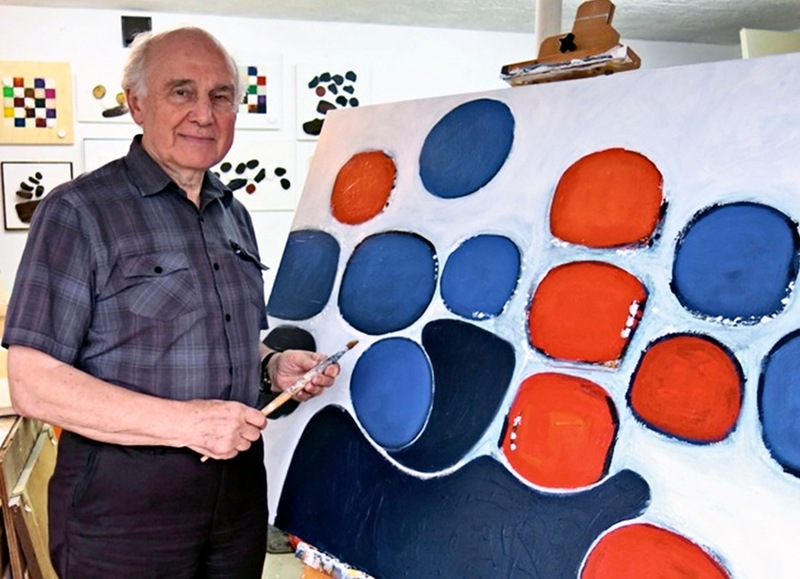 “I look and absorb colours, forms and textures in my environment,” he says. “then find myself in the reshaping of these essential elements.” Marner’s quest for spiritual connection and metaphysical meaning is in tune with many abstract painters from the last century, including Mondrian, Kandinsky, and Mark Rothko. Currently, explains Marner, abstract painting is often viewed as an intellectual and secular activity. But it’s roots can be traced to the concept that geometric forms elicit and encourage spiritual evolution. Terence Marner welcomes your interest. His artwork is available for sale and exhibition. Please contact the artist at tdjmarner@marner.ca or 250 380-0157. Web Design, Content and Photos for this Studio Visit webpage by Kate Cino.